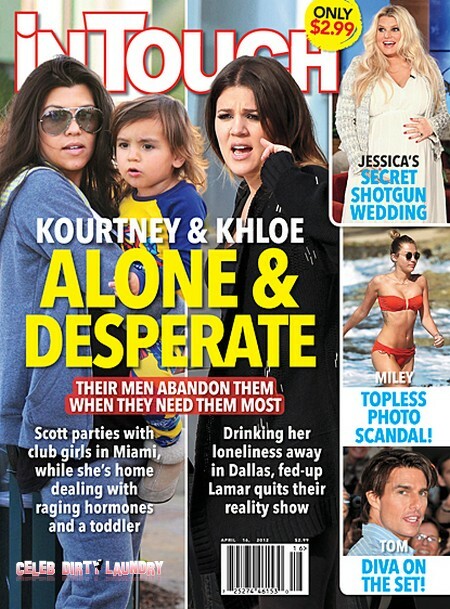 Kourtney and Khloe Kardashian have been abandoned by their men, Scott Disick and Lamar Odom at their time of greatest need. It seems that as big sister Kim Kardashian comes under attack, all of the support structure surrounding Kourtney and Khloe has got up and left! As we reported earlier on CDL, Kim and her security team fear for her very life as a secret enemy plots against her. In Kourtney and Scott’s case the problem is familiar – Scott is out partying and grabbing women while Kourtney struggles with pregnancy and caring for their 2-year-old child, Mason. Of course since Kourtney is a multi-millionaire with an entire team of hired help it is somewhat difficult to take her struggles too seriously. Scott is already well known as a total lecher who tends to avoid responsibility. He dreads being saddled with another child and only sticks around for the Kardashian fame and fortune. First of all, Khloe is NOT lonely in Dallas – she is on TV giving interviews, doing her own radio show and is a short hop to her nasty family in Los Angeles. Every time you turn around Khloe is there in the media and in your face. You would think the Kardashian sister of questionable parentage had been stationed in Antarctica or on the moon… hey, could we arrange that? As far as Lamar quitting the reality show, forget about it. That famewhore knew exactly what he was getting into when he married Khloe and that was why he did it! Lamar loves the spotlight and as his basketball career winds down his need for the Kardashian media hype and hookups grows. So that is our take on this cover story. Do you agree? Let us know in the comments below.